Did you know that only four percent of sunglasses sold are manufactured in the United States? Weber Vision Care is pleased to carry a line of sunwear made in America. Founded in Massachusetts 1972 as an optical machinery factory, Randolph Engineering began making sunglasses six years later. 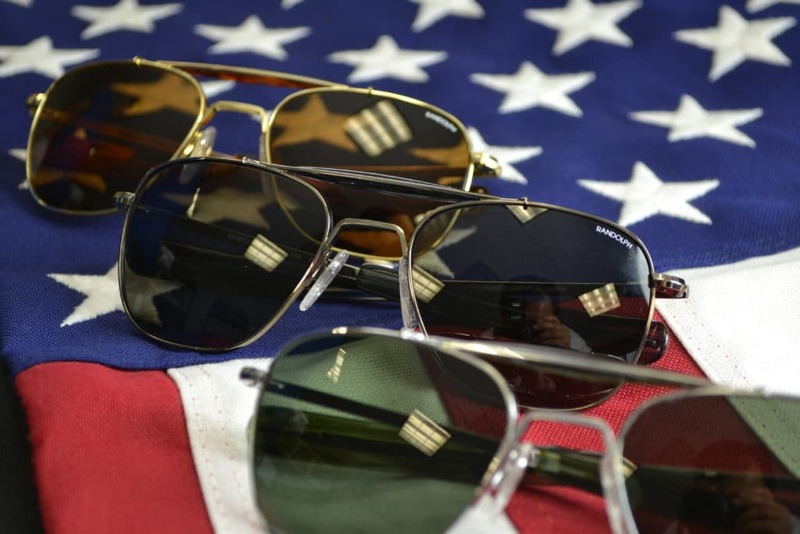 For many years, the company produced sunglasses in Randolph, MA exclusively for military pilots. Randolph’s distinctive style stems from that heritage. The straight-back sides of many sunglasses, for example, were created because they are easy to put on under a helmet. In the 1990s the company slowly began to sell sunglasses to retail customers. When Don Draper, the lead character, on the popular television series “Mad Men,” wore Randolph sunglasses during the show’s first several seasons, sales to consumers began to climb. All Randolph Engineering glasses originate in the same place. Skilled American workers, some of whom have been employed by Randolph for 25 years, complete each step of the manufacturing process. A machine in the factory in Massachusetts begins the process by bending imported wire into eyeglass frames to fit individual lenses. It can make up to 2,000 frames a day. Then, employees solder hinges and other small parts to the frames, working around red-hot machines. Some workers add the sides (temples) to the glasses, while others use a machine that laser-cuts glass and polycarbonate lenses to fit different frame shapes. The entire cutting process takes just 17 seconds. If you’re interested in a pair of well-made sunglasses that are made in America, stop by Weber Vision Care today to check out Randolph Engineering. We have lots of patients who have come in looking for “famous-brand” sunglasses but leave with a pair from Randolph. They like the fact that we have a product made in the USA. We also have a selection of Randolph ophthalmic frames, also made in the USA.